Week 13 is the week that Spring was supposed to arrive. Instead we had snow in Massachusetts. Admittedly, not knee deep, masses and masses of snow. But enough snow to remind us that the idyllic springtime picture of daffodils, violets, cherry blossom, green buds on trees and chirping birds was a far cry away. On a positive note, cold temperatures are conducive to staying indoors and enjoying books and movies. 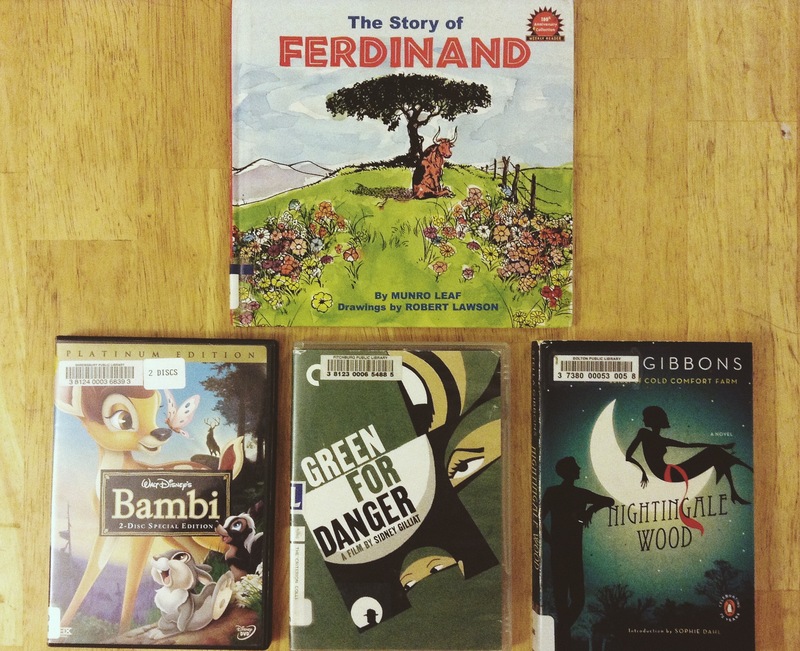 We brought home books for Little M- namely The Story of Ferdinand by Munro Leaf and video content in the form of Bambi. This was a re-watch, clearly Little M liked this movie enough to want to see it again. For me this week was hit and miss- I followed up my recent reading of Christianna Brand’s wonderful mystery novel ‘Green for Danger’ with its Criterion Collection movie counterpart. As (nearly) always the movie failed to live up to the original book. One of the major problems was that the book was still very fresh in my memory- I remembered all the subtle nuances of plot and had already even etched out how the characters looked in my mind. One of the major characters had been omitted and also a major love story completely wiped away and this thoroughly upset me. Do read the original book if you get a chance and have an inclination for reading crime fiction. I loved the book so much that I even painted the cover in my journal. ‘Nightingale Wood’ by Stella Gibbons was a beautiful, 1930s Cinderella story told to perfection. Read the full book review here. Cannot wait to read EVERYTHING else by her starting with Cold Comfort Farm. 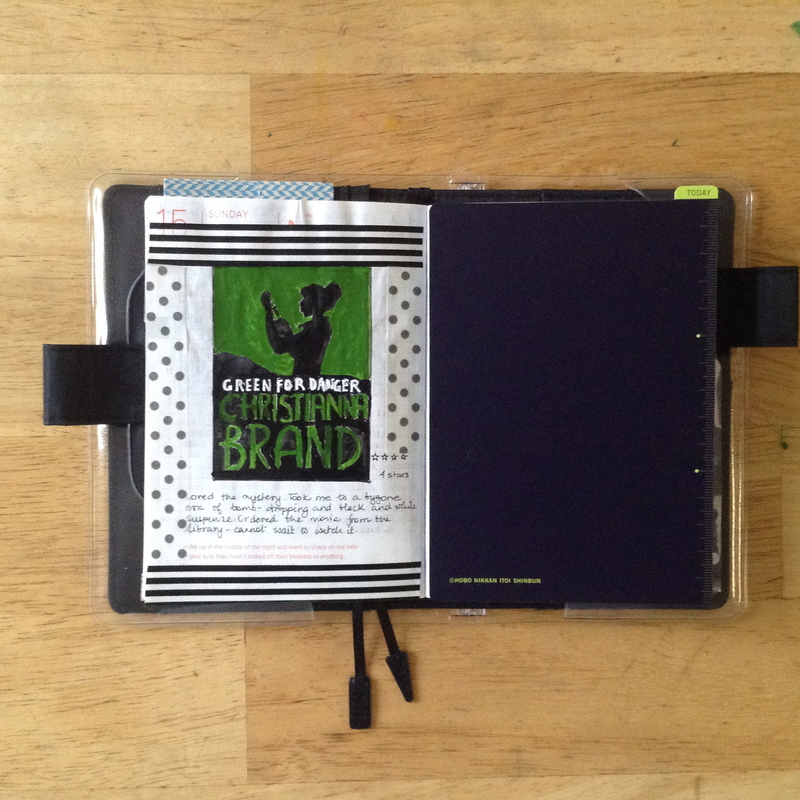 I will leave you this week with an attempt at sketching the cover of Green for Danger in my journal. Cheerio!